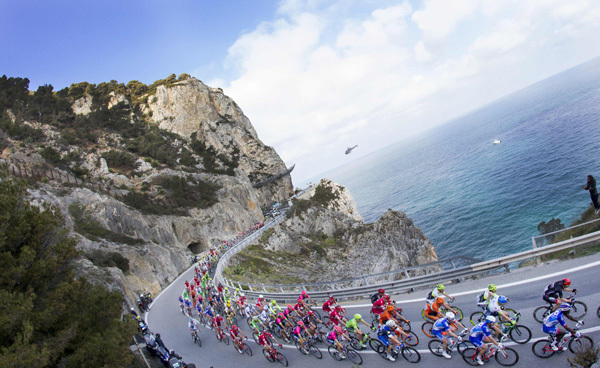 The finale of Milan-San Remo is always a lot more exciting to watch than to talk about. So let’s not bother. To boil it down to almost nothing, after near-enough 300km of racing, Arnaud Démare won a sprint from a greatly reduced front group. Démare said that as he was sprinting, he didn’t know whether there had been someone else further up the road, so he wasn’t entirely sure he’d won. Yorkshireman Ben Swift came second, which is a very Ben Swift sort of result – very impressive, but not actually a major win. Smaller wins and good placings in bigger races seem to be his thing. Motor doping’s been the big story lurking around cycling for the past year or so, coming to a head when Belgian cyclo-cross rider Femke Van den Driessche got done for it a month or so ago. But why go to the trouble of concealing the motor inside a bike when you could just as easily plonk it inside a car? Two riders have accused Démare of getting a tow up the penultimate Cipressa climb, Nibali-style. Strava data reveals that Démare was indeed quickest up the climb out of those recording their rides. He’d been held up behind a crash just before the climb and was trying to catch up with the front group again, so I’d guess he was perhaps the beneficiary of one of the stickier bottles. I feel I have to clarify that ‘WorldTour’ isn’t a typo every time I write it, which surely isn’t a good sign branding-wise. The latest on the season-long women’s road competition is that Lizzie Armistead has failed in her bid to win all of the things. She abandoned the second Women’s WorldTour event, Ronde van Drenthe, after 50km because she was feeling ill. It didn’t hold her back for long though. This weekend she won the third event, Trofeo Alfredo Binda. She’ll be racing Gent-Wevelgem this coming weekend and there’s a men’s version of the race too. The route has cobbles in it, which must mean it’s now officially spring.